The lack of substantial trading volume is keeping Litecoin to where it was – in a long-term bearish bias. From over a week, the silver coin is limitedly consolidating sideways and has tested 1.90 as the key support level. It meanwhile has attempted to break above 2.20 – the 2014’s low and now an important resistance level. As you can refer the 4H chart above, the 26- and 12-hour EMAs are almost parallel (magenta and light green lines, respectively), while the price is way below the 50-, 100- and 200-hours SMA (blue, black and red line respectively). The RSI is around 34, and MACD is indicating to go below the signal line, thus intensifying the prevailing negative value. Every indicator, at press time, points to a downtrend. The change-of-trend however seems equally possible once the 1.90 support is tested. A short-term bullish correction is still expected once the price manages to step above the 2.20 resistance level. If it does so, then the next upside risk will fall towards 2.60-2.65 area. 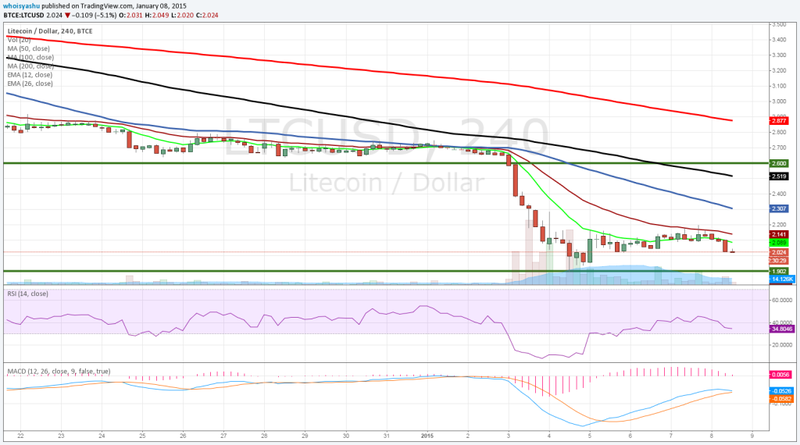 Throughout 2014, we have seen how Litecoin price movements have closely followed Bitcoin. This week however, the silver coin has reacted limitedly to its golden counterpart. So at this point, there is nothing that is actually influencing Litecoin value, whether to the north or south. The opinions above are personal, and the writer and NewsBTC.com hold no liability for incurred losses as a result of this report. Trading is risky, do it carefully!